You'll be £12.99 closer to your next £10.00 credit when you purchase Tracing Your Boer War Ancestors. What's this? This book will act as an informative research guide for those seeking to discover and uncover the stories of the men who fought and the families they left behind. It will look in particular at the kind of support the men received if they were war injured and that offered to the families of the bereaved. Some pensions were available to regular soldiers and the Patriotic Fund, a charitable organisation, had been resurrected at the beginning of the conflict. However for those who did not fit these categories the Poor Law was the only support available at the time. 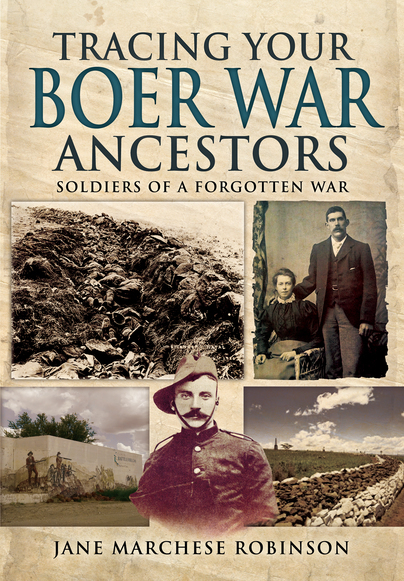 The book will explore a variety of research materials such as: contemporary national and local newspapers; military records via websites and directly through regimental archives; census, electoral, marriage and death records; records at the National Archives including the Book of Wounds from the Boer War, the Transvaal Widows’ Fund and others. Robinson's book is a good read for anyone interested in learning more about the Boer War. In this book, departing from the research-driven approach of others in the series, the author explores this blighted history in depth, aided by a fantastic collection of first-hand reports gleaned from families of men who were there. The actual research advice section forms an appendix and is a little brief perhaps, but nonetheless provides useful pointers, and overall this book is very useful for revealing the experiences our Boer War ancestors would have undergone. This book is full of interesting detail and is an engrossing read, with a full index and a list of sources for your own research. 180,000 Britons alone involved in the conflict. well as many other aspects. ideal background information necessary to produce a high-quality project. Despite the fact that 180,000 Britons fought in the Boer War from 1899-1902, just 15 years before the start of World War I, few ordinary researchers know much about it. This new guide aims to fix that, providing a background to the war in South Africa, the regiments, the conditions, the battles, the men and the families they left behind, as well as the aftermath. Here you can discover how to research their lives, their military service and their times using contemporary records, both on and offline, before you start exploring a lesser-known aspect of your family's story. Superb study of archive documents from a war that is now largely ignored by the vast majority of people. Jane Robinson's suggestions for finding out about an ancestor who served in this conflict are terrific, and the book will be immensely useful to archivists and genealogists. I read the book "Tracing your Boer War Ancestors, Soldiers of a Forgotten War" by Jane Marchese Robinson over the Christmas Period and thoroughly enjoyed reading it. I know more than most people about the subject after studying it for the last 30 years as my grandfather Bombardier Thomas Wilson 54838 M Battery Royal Horse Artillery served in South Africa and got the South African Medal with clasps Cape Colony, Relief of Mafeking, Transvaal and Orange Free State. I have corresponded with Jane over the years, as I got interested in how she was going to write a book about a war that was long over before she was born. She has done it brilliantly and it is quite refreshing to read a different account of the Boer War through the letters of the soldiers, wives, sweethearts and relatives of the soldiers pulling no punches in dealing with the social and military injustices and actions committed at the time and what we see as wrong today and would be seen as war crimes today. Jane travelled the country and even went to South Africa to check places and facts. The result is a remarkable book that even taught me a few things I did not know. Once I picked it up I could not put it down and read it within 5 hours. If you have a relative that served in the Boer War, this book is a must. This is an interesting work which covers aspects of the war not generally mentioned in purely military histories. After graduating in Economic and Social History Jane Marchese Robinson spent some thirty years working as an advocate for marginalised groups, including the homeless, people with disabilities and mental health problems and asylum seekers. This work gave her an insight into many aspects of human experience. In 2005 she rekindled her childhood passion for writing at Adult Education classes. She followed this by undertaking the MA in Creative Writing at Plymouth University where she honed her skills writing short stories, poetry, a screenplay and began work on her novel, which is also set at the time of the Boer War. She graduated with Merit in 2011 and has been writing full time since then.